A well-known piece of local historic industrial art has found a new home at the Galt Museum. 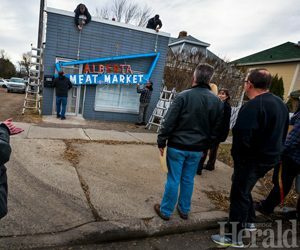 The Alberta Meat Market sign was lowered gently to the ground by work crews Thursday afternoon and put on a flatbed truck for transport. The removal of the sign, first built and placed in 1959, marks the end of one era in the community and the beginning of a new one as the century-old Alberta Meat Market building will be converted to a cannabis retail store and renamed the Green City Market.